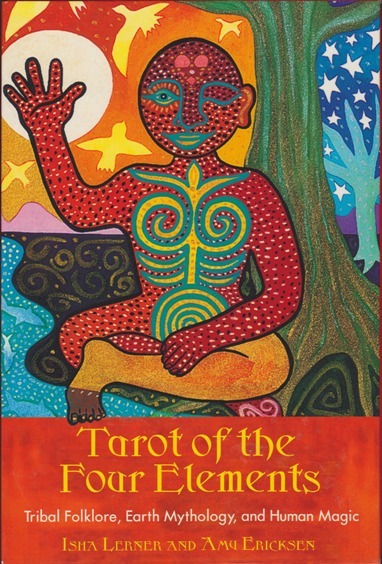 78 cards packaged as part of a set with a 198 page soft cover companion book. The book and cards are housed together in an exceptionally sturdy cardboard shelf box that is in two parts -- an outer case and box that slides into it, kind of folder or binder-style. The shelf box and the companion book have identical covers; thus, only the box's front cover is pictured here (I'd usually show both the box and the book cover). 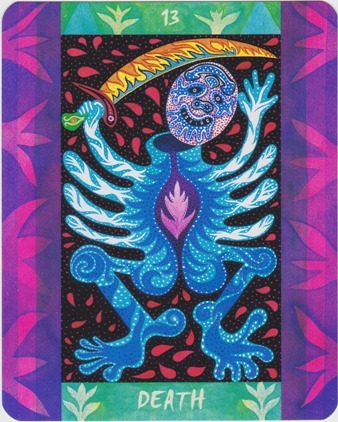 The cards are somewhat square, measuring 11 cm tall x 8.9 cm wide. 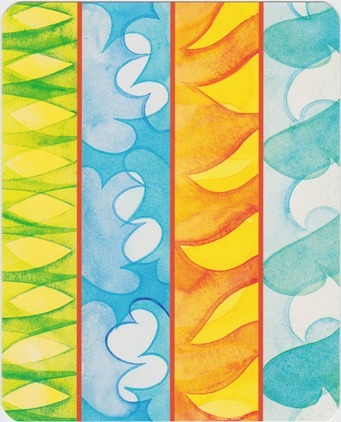 The card stock is thin and slightly flexible, with a matte finish that is a little rough to the touch. It feels a little sub-standard, to tell the truth. Backs are non-reversible, though you'd have to be paying attention to know the difference. The minors are vibrantly illustrated, but not scenic. 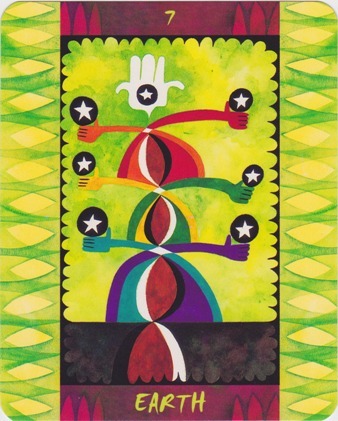 Suits are Air (Swords), Fire (Wands), Water (Cups), and Earth (Pentacles or Coins). Courts are Page, Knight, Queen, and King. Ace cards are numbered/titled 1, instead of "Ace." Justice is 8, Strength is 11, and the Fool is numbered 0. 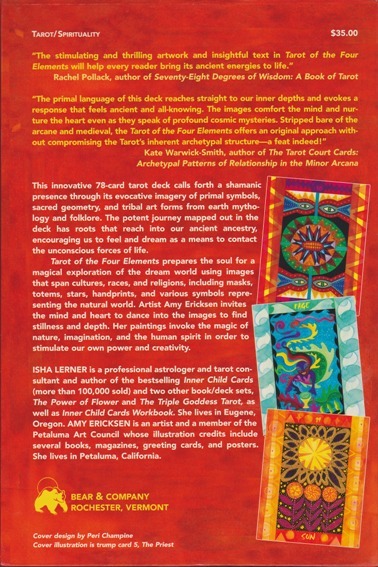 Tarot of the Four Elements: Tribal Folklore, Earth Mythology, and Human Magic -- companion book by Isha Lerner with illustrations by Amy Ericksen. Softcover. 198 pages. Black and white. 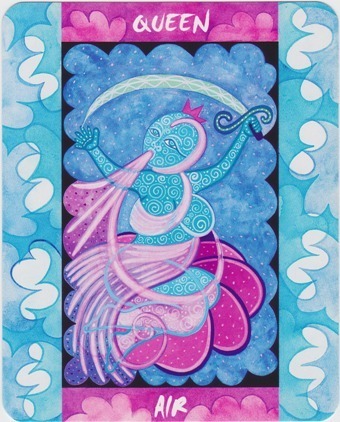 Amy Ericksen (artist), “Tarot of the Four Elements,” The Osborne Tarot Collection, accessed April 21, 2019, http://tarot.zerosummer.org/items/show/277.